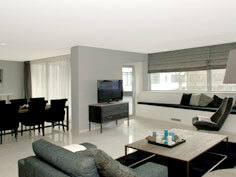 For Business Execs looking to find comfort, service and privacy in Rotterdam, we have found the perfect solution. The SSA Skyloft Collection lists a group of apartment types housed in the same modern building in the very centre of Rotterdam. The apartment tower is on Wijnhaven and consists of 27 floors of luxury furnished serviced apartments reaching 88 meters in the Rotterdam skies. It has a beautifully designed entrance hall with granite floor and wood-paneled walls. There is also a video intercom here that provides contact between you and your visitors. The lobby has a doorman who serves as your contact for a wide variety of services. The building boasts 45 apartments varying from three bedroom apartments to one bedroom sky-lofts and two bedroom penthouse apartments with huge roof decks and amazing views of Rotterdam, the river Meuse (Maas) and the famous Rotterdam ports. On the lower two floor there is a professionally equipped gym and cafe-restaurant. This means you can easily enjoy a work out during a busy week and even enjoy fine dining within easy reach. The building has a high security private parking in the basement that provides one or two parking spots. For most outings in Rotterdam you will not need a car as Rotterdam has an excellent public transport system that is quickly accessed from this beautiful tower.